The Process Filtration Division at Parker Hannifin Corp., of Lebanon, Ind., has released a new product/applications guide specifically geared for the process water market. 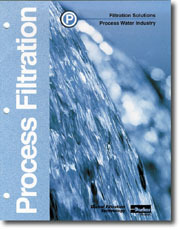 The guide offers filtration product and placement recommendations for processors that filter potable water, process water, boiler feed, rinse water and wash water. In addition to detailed product descriptions and ratings, the new guide also delivers a profile on the company’s comprehensive customer support capabilities.